Posted on 2nd May 2012 14th January 2017 5 Comments on Repairing a heat pump – How well is it carried out? On the generation side of things, market forces and other factors drive the decisions that dictate how the National Grid buy and produce electricity. The UK’s generation ‘mix’ leads to a figure of how many kg of CO2are released for every kWh of electricity produced – on average, around ½ kg for each unit of electricity. To make things complicated, this varies over the day, over the seasons, and will vary year on year. At this point it seems important to turn our attention to what efficiency levels heat pump technology can offer, then to seek the compromise that all such designs are based upon; cost / benefit. If very high COPs are attainable, but excessively costly to manufacture and install, they are probably of little benefit. At the other end of the spectrum; cheap low-efficiency systems may bring no carbon saving at all. We need to look for application that are practical and affordable to install, and show a good CO2 saving. The question to ask here is – is the particular application a good one for this technology? Is it one where a high COP can be achieved without excessive installation cost. If not, maybe a different technology should be adopted – eg. If a boiler can be installed for 1/3 the cost, the money saved may allow some very serious insulation. The outcome might give a better net energy saving. A holistic view is needed, and for heat pumps to compete- they need to be energy efficient. My perception of people’s expectations for SPFs (annual COP) is that they have had a knock over the last year or so. I had hoped that SPFs might pan-out around 4 – given some improvement in the technology over the years, however, it seems that many systems have in recent years, fallen short of what’s-possible. The recently produced Emitter Guide ( http://www.microgenerationcertification.org/admin/documents/MIS%203005%20Supplementary%20Information%202%20-%20Heat%20Emitter%20Guide%20v2.0.pdf) has been developed as a ‘guide’, not a design tool (‘Emitter’ referring to ‘heat emitters’ – radiators or underfloor). If I understand it correctly, the guide was produced to assist in ‘steering’ designers and installers towards better systems. It has a well laid-out flow chart for the installer/designer to consider both new and existing radiator, and should be commended highly for its recommendation to stand-back and consider implications of improvements to thermal insulation, or reducing ventilation losses. This is a welcome deviation from the old just-do-my-bit ways of the industry. However, as I scan down the expected SPF figures for the various options of radiator oversize or underfloor heating pipe-spacing, The question I am asking myself is – how does anyone know what SPF to aim for? I have considered this intangible question for many years, and I am still much in the dark. The general drop in COP expectation is not helped in my view by the range of SPFs quoted on the emitter guide which, for the air source system, has a mid-range of 2.85, and the lowest figure (2.1) relates to CO2figures worse than gas. If one were totally in the dark, one would probably be ‘swayed’ to thinking that an SPF of 3 was quite reasonable. 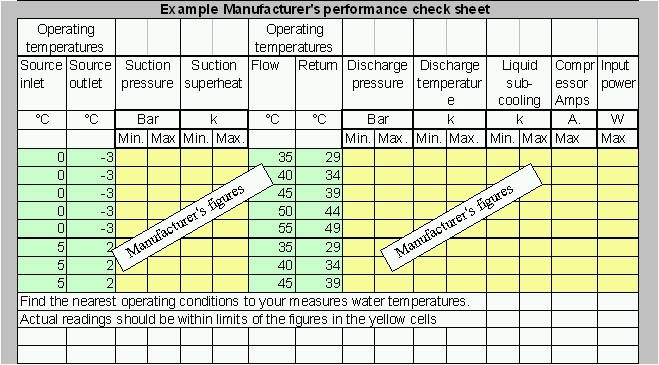 It is also important to note that the figures relate to space-heating only and since the vast majority of installations also heat hot water, and since DHW heating can occur with a relatively low COP in the region of 2 to 2.5, it is clear that some of the figures quoted will be pulled-down by DHW heating in practice. With this in mind, the 6 star option (flow temperature only 35°C) could be viewed as ‘normal’ as opposed to the ‘exceptionally good’ that it might currently appear, being top of the list. I have added this intesting graph sent to me by John Logan of Maine USA (East Coast). Its interesting to see their experience. John is a pioneer and proponent of the ‘Standing Column’ borehole system, and their experience looks impressive. They are experiencing average COPs of 4.5. This shows an application and a climate that match well – here we have very competitive running costs and very good SPF. The graph also shows a 12RLS2 air-air split systems with COP almost 3 – obviously fits well in their climate. Posted on 11th April 2012 14th January 2017 4 Comments on How energy-efficient should a heat pump be?